First off lets start with the post you use. 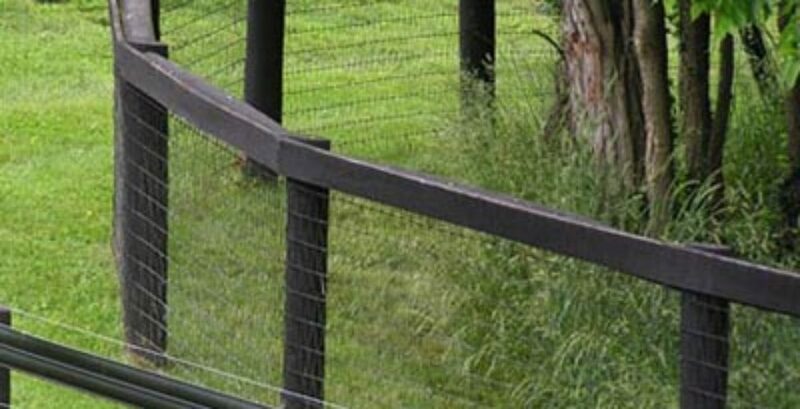 No matter which type of fence you use (with the exception of the snap together kind) it will rely on the fence post. The fence post can really be considered the foundation of your fence. Just like a house, if your foundation is weak then no matter how great the house is your going to have nothing but trouble out of it. The treatment of the post is the most important thing about the post whether its a faced or round post. Not all post are treated equally. Really the only way to tell if a post is treated correctly is to cut a few inches of the end and see is the treatment process has penetrated all the way through the post to the core of the wood. You will see a uniform color through the post if it is treated right. A post that is not treated well will have a very different color in the center as opposed to the outside the post. If you see raw wood in the center then you obviously need to get some different posts. You can really tell if you have bad post because in about 5 years or so they will start to hollow out on the top of the post and almost dissolve as if someone poured acid on them. But once they are in the ground its to late. Faced post are just a round post with a face cut on the front of the post. Face post are the straighter and better of the 2 kinds of post because they have to be straighter for the simple reason that you need a good straight piece to go through the saw mill and have a face put on them. So basically what mills do is pick the best straightest post out of all their stock to make faced post with. What ever they have left over is left alone and sold as round post. So right away they are the straighter post, before they even have the face sawed onto them. Faced post also have the advantage of having a higher surface area to nail a board to. They have a nice flat surface to hold the boards in place. Think about your house, are 2×4’s round? 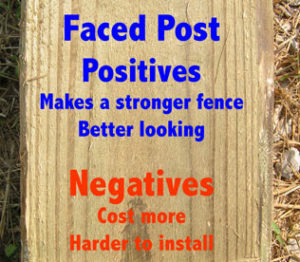 The flat surface of a faced post makes a big difference in the strength of your fence. Also the flat surface of the faced post will make a board fence look a lot better, a round post will not have a smooth surface for the board to lay flat on and will not give you as straight of a fence line. By straight fence line I mean that when the post are in the ground you should be able to look down the line and see one post. Not tops sticking this way and that, and the bottoms out of alignment. The straighter your fence line the longer your boards will not warp or curve off of the post. 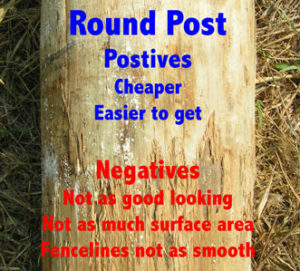 A round post due to its inconsistencies will not be able to give you a straight fence line like a faced post will. Round post will obviously have a lot less surface area to build on. But they are about 50 cents -$1 cheaper. They are easier to get since they are what the mills cut the most of. As long as you are using round post for anything but board fence they are really the better post to get. Centaur and wire really do not benefit from a faced post since they are nailed and stapled straight down the post. Round post do not have the quality of a faced post, so they tend to have a few more crooked post in a bundle. So basically it all boils down to what fence you are going to put up, if it has a board at all then go with the face post. Centaur, hi tensile wire, Vmesh with a Centaur top rail really only needs a round post. Round post are cheaper so if budget is a major concern then they will work but at the cost of looks and strength of the board fence.